Our huge pancakes are made from scratch! Every night the dry portion of the ingredients are mixed together. When we are ready for fresh batter, the wet ingredients (including farm fresh local eggs) are added… After a couple of flips, the big, fluffy pancakes are heading to your table! Our Famous 100% lean pork sausages are made right here. We mix in seasonings and our own maple syrup to create this one-of-a-kind maple sausage. Gluten Allergy/intolerance: Gluten-free pancake mix available by request (contains whole egg powder) (does not contain dairy). Our Beans are gluten-free. There are wheat crumbs in our sausages. Egg Allergy: Egg-free pancake mix available by request. Dairy/egg free mix available by request. Our sausage and beans are made without egg. Milk/Dairy Allergy: Milk-free pancake mix available by request. Our sausage and french toast are Dairy free. Beans contain dairy. Nut Allergy: There are no nut ingredients in our meals or pure maple products (maple syrup, maple sugar, maple taffy, maple butter). Occasionally, we do have maple sugar coated nuts for sale at our store that are prepared in a separate kitchen. Servers and cooks may have come in contact with nuts. For those with severe nut allergies we do not guarantee that we are a nut free environment. We use the same grill to cook all pancakes and French toast. When cooking special order pancake we use a paper towel with a few drops of vegetable oil to wipe off the area of the grill where the pancake will be cooked, rub it down again with fresh paper towel, cook the pancake on that area, and use a separate clean utensil to flip the pancake. We have been able to accommodate most people with sensitivities in this manner but encourage those with severe sensitivities or allergies (to wheat, eggs, etc.) 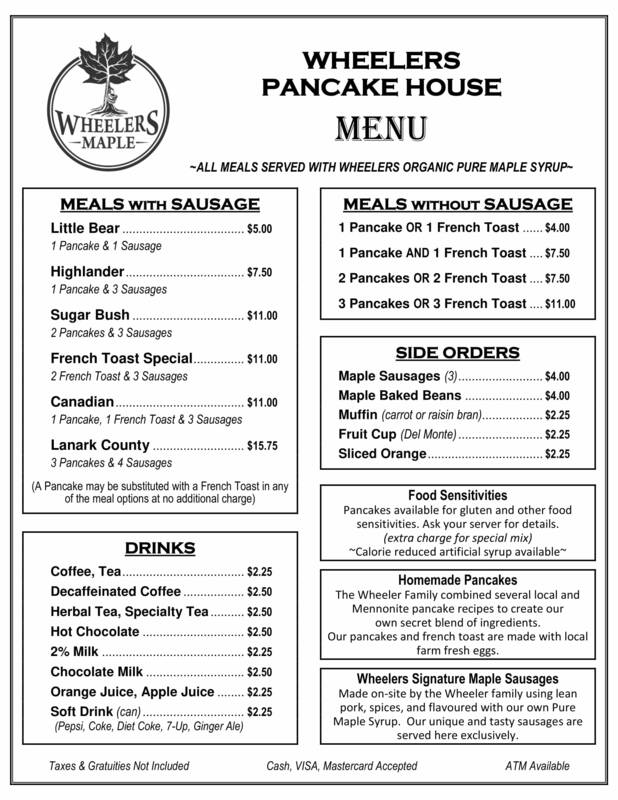 to bring their own precooked pancakes (or french toast) which we can heat in the microwave and serve with our pure maple syrup for a small service fee.